60 minutes narrow gauge steam railroad video or Video CD ROM about a steam engine in Austria called Wackelstein Express. This episode deals with a prototype narrow gauge steam engine which never went into mass production. 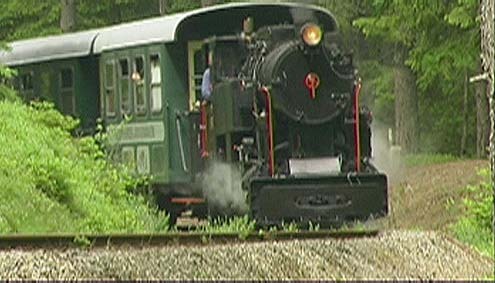 We tell the story about the historic narrow gauge steam engine of this railroad and follow it through senic countryside. While our work the narrow gauge steam engine had a technical problem, which we documented in this railvideo, as well as the new steam engine from Romania, (also a narrow gauge one) which was delivered during that time. The narrow gauge steam railroad is type 170.1 and was constructed for an Austrian narrow gauge factory, which finally decided differently and therefore the steam engine couldn�t be mass-produced. Today the narrow gauge steam railroad is operated my a railroad club, where a handful of enthusiasts dedicate their leisure time to maintain, operate and promote this railroad, which is threatened to be closed in future.